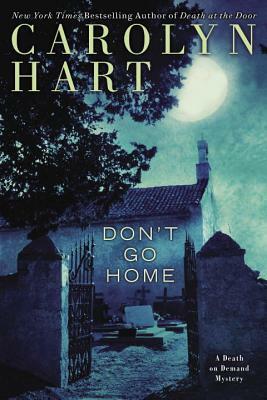 Bookstore owner Annie Darling is hosting a party to celebrate former Broward’s Rock resident Alex Griffith and his bestselling new novel, Don’t Go Home. But after the local paper announces that Griffith aims to reveal the real-life inspirations behind his characters, perhaps the author should take his own advice. Not everyone in town is ready to give him a glowing review. An accomplished master of mystery, Carolyn Hart is the New York Times bestselling author of more than fifty-five novels of mystery and suspense including the Bailey Ruth Ghost Novels and the Death on Demand Mysteries. Her books have won multiple Agatha, Anthony, and Macavity awards. She has also been honored with the Amelia Award for significant contributions to the traditional mystery from Malice Domestic and was named a Grand Master by the Mystery Writers of America. One of the founders of Sisters in Crime, Hart lives in Oklahoma City, where she enjoys mysteries, walking in the park, and cats. She and her husband, Phil, serve as staff—cat owners will understand—to brother and sister brown tabbies.